For most of us, the Fourth of July is a time to enjoy the company of family and friends, having fun and creating memories - whether at home or away on vacation. But for some families, the holiday is a nightmare. Homes each year are damaged by wayward fireworks. Thousands of people are injured in accidents. At West Town Insurance Agency, we want your holiday to be happy, but also safe. So here are some tips to help you protect yourself and your property on the Fourth. 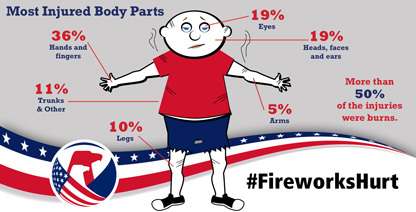 To minimize the risk of injury, don’t use consumer fireworks. Attend a public display conducted by professionals in downtown Edenton or elsewhere. A responsible adult should always be present when children - even teenagers - are around fireworks. More than half of fireworks injuries happen to those younger than 20 years old. Never carry fireworks in your pocket or shoot them off in metal or glass containers. With some common sense and planning, the Fourth of July can be both safe and enjoyable for everyone. Whether you’re staying at home or heading to downtown Edenton, everyone at West Town Insurance Agency hopes you have a wonderful time celebrating our independence!